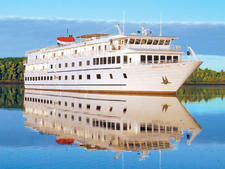 One of several small ship lines that has staked out a claim on United States rivers, the Great Lakes and coastal waterways, American Cruise Lines has been sailing the Mississippi since 2012. 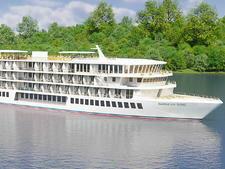 Its newest vessel for the river, America, is slightly larger than the line's other ships, with 185 passengers, but it features the same easygoing ambiance and attention to enrichment. 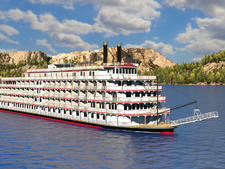 Let's get one thing out of the way: Most of the passengers on America -- and Mississippi River cruises in general -- are older. How old? We brought our active 74-year-old father on the cruise, and he kept saying that he felt young compared to everyone else. Many cruisers are in their 80s, and some also have mobility challenges that make the boat's elevator, coach tours and wait-serviced meals a boon. 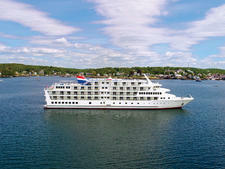 While no cruise line wants to be considered a ship for seniors, we think that America and the company should be applauded for providing the demographic with a comfortable option. The term comfortable could also be applied to the ship's clientele, as a cruise on America is significantly more expensive than a similar experience in Europe; per person costs on the ship are akin to what you'd pay on a luxury line such as Seabourn or Silversea. 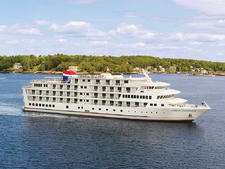 That's partly because the company has an all-American crew, with college kids making up the steward and deckhand staff. The line also doesn't nickel-and-dime with additional charges -- there's no casino, specialty restaurants or bar onboard, and the line includes a shore excursion in every port. Fares through 2018 also include gratuities, a pre-night hotel stay and transfers. America has a few quirks that bear mentioning. Passengers pre-order lunch and dinner on a card at breakfast, with half portions available (the staff says advance ordering cuts down on food waste and also allows people with dietary restrictions to be accommodated). The college kids serve as both dining staff and stewards, doing double duty on 12- and 16-week shifts for pay and school credit. We found the fresh-face youth to be enthusiastic and friendly, if a little green; mix-ups at mealtimes happened frequently. And then there's the aforementioned lack of a bar: although the line allows you to bring your own alcohol onboard (and will give you a bottle of complimentary wine after dinner), the setup means that most socializing on the boat ends after evening entertainment at 9:30 p.m. Night owls will be disappointed. But all that doesn't negate what the line does right. The enrichment on the ship is first-class, with an enthusiastic river historian who could make even the driest subject riveting. The entertainment is on point for the audience, with musical acts and comedians brought in from New Orleans, Vicksburg and other stops along the river. Don't expect much rock music -- this is an audience that better knows the words to "Old Man River" than "Proud Mary" -- and you'll be fine. And the line does a well-attended cocktail hour before dinner with a full bar. On our sailing, most passengers seemed satisfied with their introduction to the South on America. 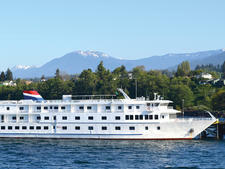 About 40 percent of the people onboard our cruise signed up for another voyage with the line. 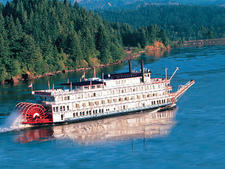 We personally loved the spacious cabins, the cute rocking chairs on deck and the friendliness of the crew. As long as you're aware of the demographic onboard and don't mind a less active vacation, America can provide an excellent experience. 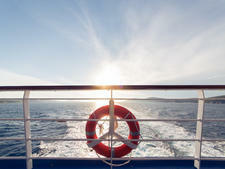 American Cruise Lines says that the average age for all of its passengers is low 60s. 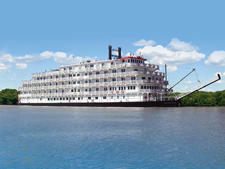 But that's not what we observed on our Lower Mississippi River cruise. On that sailing, the average age was easily 75, with many passengers older than that. Because the ship has an elevator and the staff makes accommodations for people with mobility issues, it's an excellent choice for those who feel rigorous travel is beyond them. It's a social ship during the day -- passengers wear nametags at all times and we saw many friend groups forming. Almost all of American Cruise Lines' passengers come from the United States. Although a river sailing on American Cruise Lines costs as much as a luxury line at sea, you won't see the same designer duds onboard. We saw very few brand names on our cruise, and little bling. Daytime wear is comfortable for tours, with collared shirts and shorts for men, and capris and T-shirts for women. Nighttime is equally casual, with most women wearing a nice blouse and slacks or a dress, and men wearing collared shirts and slacks. There is no formal night, although some men do wear sports coats at the Captain's Dinner, held once per cruise. The line also recommends that passengers bring comfortable walking shoes, a hat, a rain jacket and a sweater for cool evenings (or to counter the air conditioning). 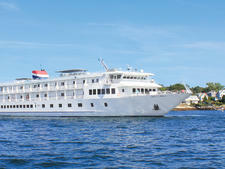 American Cruise Lines includes the following in its fares: wine, beer and soda at lunch and dinner; a full bar at the daily cocktail hour; Wi-Fi; and a daily shore excursion. Fares through 2018 include gratuities, a pre-night stay at a hotel and transfers. The onboard currency is the U.S. dollar.